Due to our long-time cooperation with sport professionals we could prove the necessity of an optimal support of the activity and regeneration phases. To avoid muscular problems it is important to provide the body with essential substances before the individual phases. With our products we have succeeded in making these essential substances available to the body in order to be fetched up for the respective need. All products are certified medical devices and the formulations are protected by patent law. 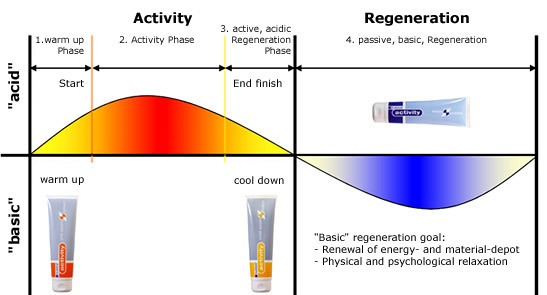 passive regeneration phase (recovery phase). In principle the schematic course of the activity and regeneration cycle of humans is always equivalent, independent whether it concerns a brief or a long term exercise. With a perseverance sports e.g. Marathon the curve runs flatter and longer, with other sports like Bodybuilding in contrast more steeply and more briefly.